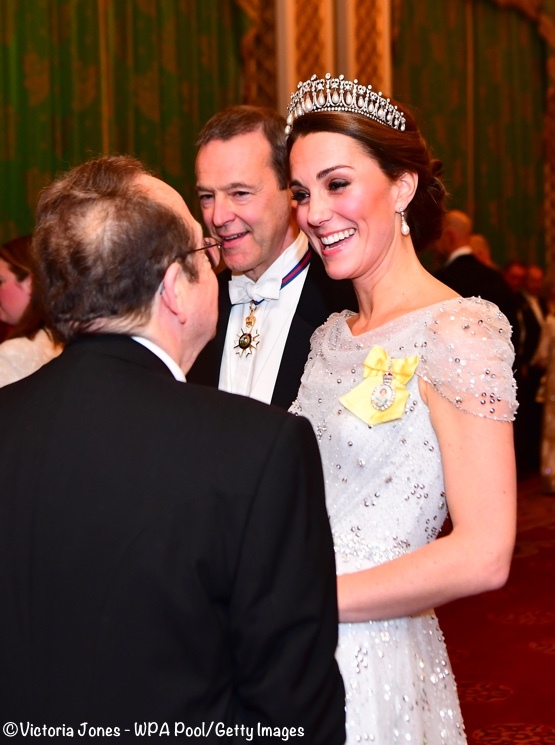 The Duchess sparkled in the Lover’s Knot tiara and a new evening gown at tonight’s diplomatic reception. Held at Buckingham Palace, the annual event is hosted by the Queen. The dress code is white-tie, thus the tiaras. In these photos, the Duke and Duchess are seen leaving Kensington Palace. 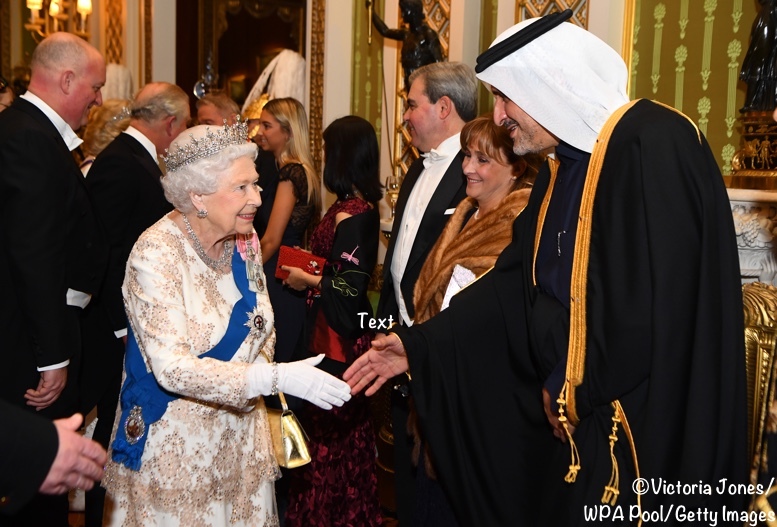 The gathering is the highlight of London’s diplomatic social calendar in London, attended by hundreds of foreign diplomats, British diplomatic corps members, government officials and senior members of the royal family. Historically there are no photos from the event. We are very fortunate, for that is not the case tonight. 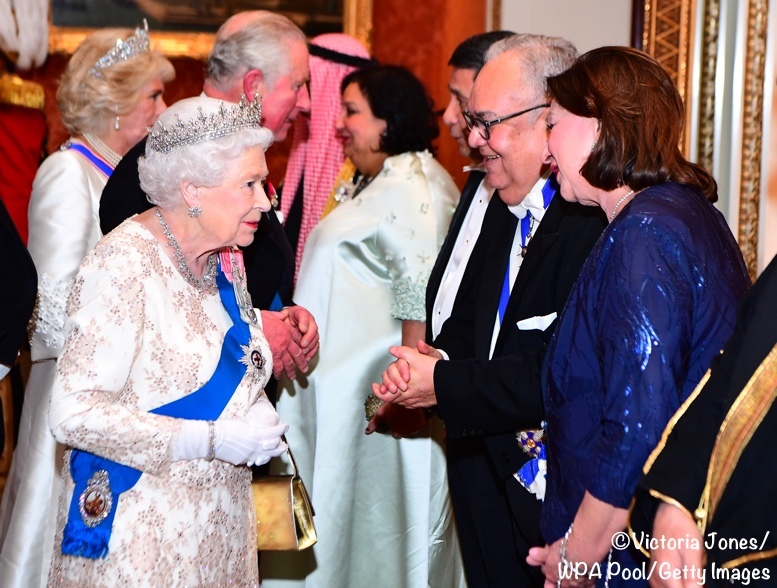 The reception, attended by members of the Diplomatic Corps based in London, supports the work of the Royal Family in representing the UK at home and abroad. This work includes the hosting of State Visits and The Queen’s regular audiences with Ambassadors and High Commissioners. HM was in an Angela Kelly gown featuring tiers of contrasting lace. Below, the Prince of Wales and Duchess of Cornwall; the Duchess is wearing a Bruce Oldfield design. Kate was in a new gown by Jenny Packham. It is crafted in an off-white shade with a sheer overlay adorned with sequins and crystals. It’s difficult to tell from the photos, but it looks like there *might* be multiple layers of the sheer material. The overlay is softly draped at the neckline and cap sleeves have the same folds; the waistband is defined by crystals or rhinestones, and the gown has a full, sweeping skirt. You can see the pleating, or folds, at the back of the garment. A closer view of the waistline. Our thanks to Heaven for sharing the Jenny Packham confirmation on the dress. 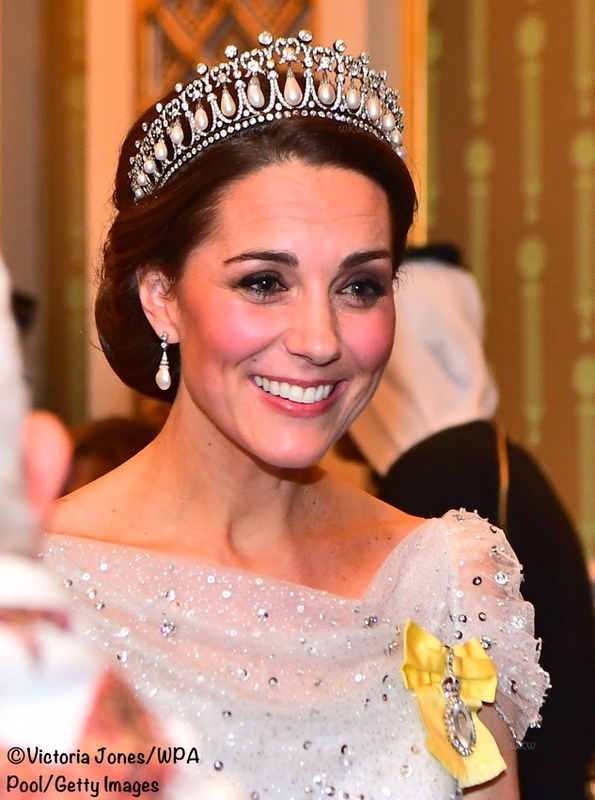 As noted, the Duchess wore the Lover’s Knot tiara. 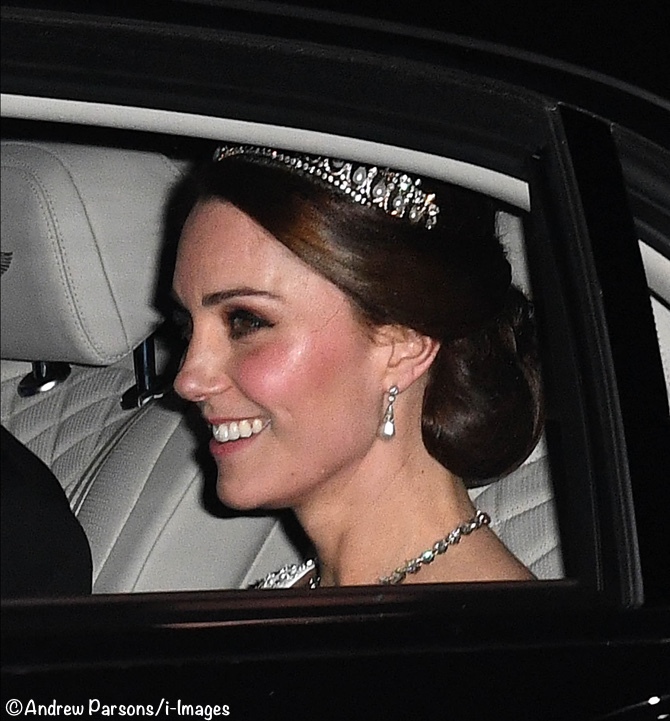 …the piece is definitely the most famous lover’s knot tiara today, it was originally a copy of another almost-identical sparkler that once belonged to the Cambridge family. 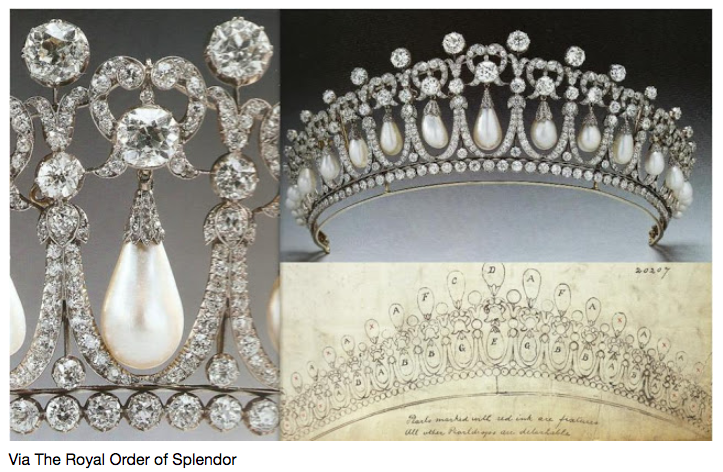 The lover’s knot motif was very popular in the nineteenth century; the knots are the pretzel-like elements at the top of the tiara — the part from which the pendant pearls are suspended. Diana famously found the piece to be too heavy and headache-inducing, and often opted to borrow the lighter-weight Spencer tiara from her family instead. It has clearly become a favorite for the Duchess. This is the fourth time in a row she has opted to wear it for this event. In 2013 Kate wore the Lotus Flower tiara, also referred to as the Papyrus Tiara, but since then we have seen her wear the Lover’s Knot. 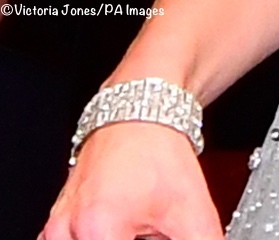 It looked like Kate wore a diamond bracelet on loan from The Queen, a piece we have seen before. The glittering bracelet is thought to have originally been a choker-style necklace worn by Queen Mary (below left) before it was converted to a bracelet. We show it as worn on other occasions. We saw the return of Diana’s Collingwood diamond and pearl drop earrings. 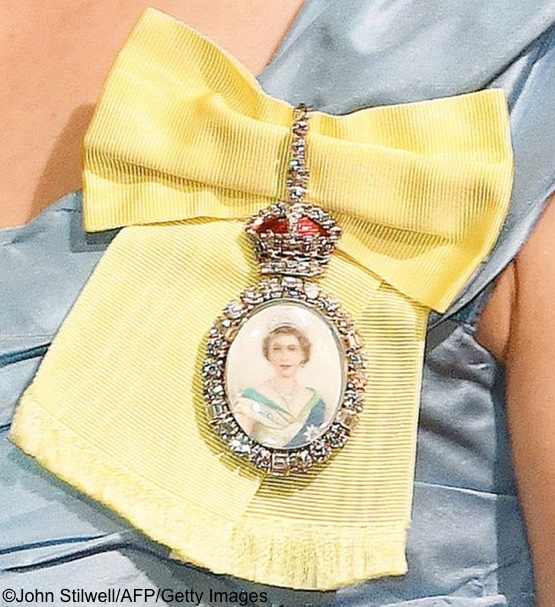 The Duchess also wore the Royal Family Order on her left shoulder. Below we show it as worn at October’s state dinner. In 2016 Kate wore a Jenny Packham lace gown. And last year the Duchess opted for an ivory or white frock with crystal beading, but we do not have any photos of the dress beyond what was visible through a car window. This was a spectacular look for Kate: elegant and very regal. 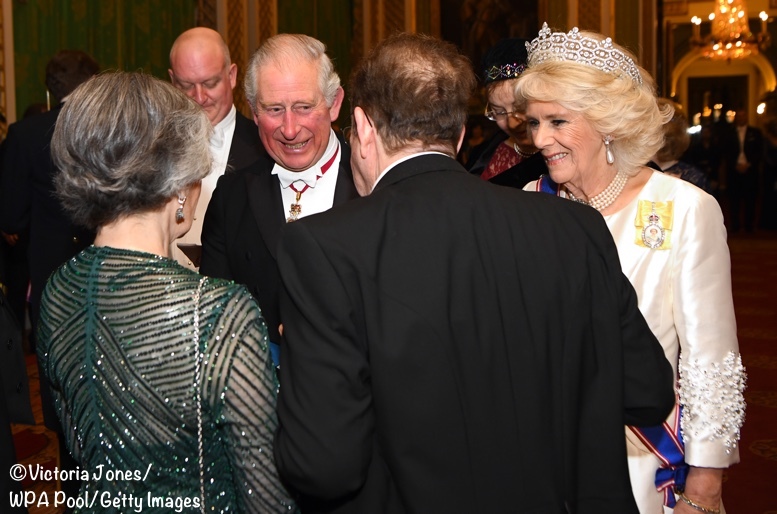 If you didn’t see our earlier post, click here to see all the photos and info on the Christmas party the Duke and Duchess hosted earlier today. 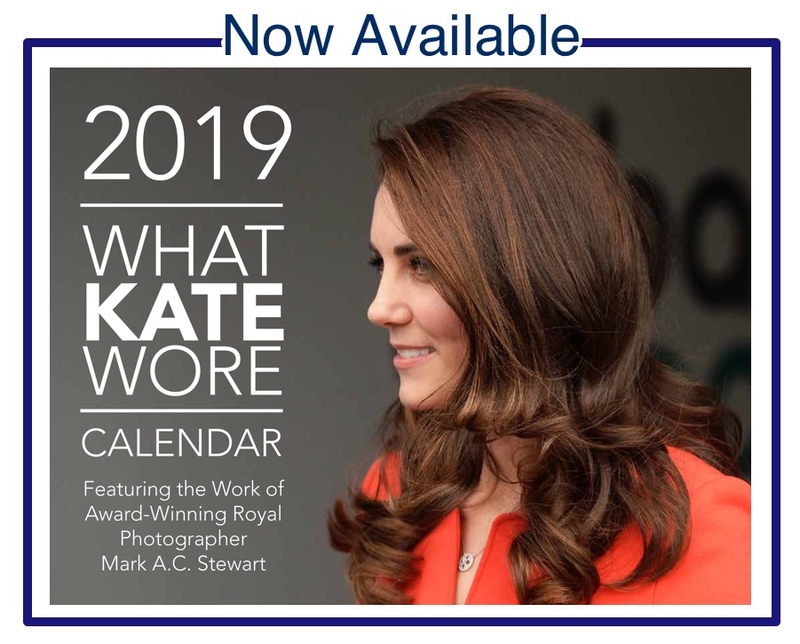 One more ICYMI, our 2019 What Kate Wore calendar is now available for ordering. Once again we are thrilled to be showcasing the stunning photographs of royal photographer Mark Stewart. One of the reasons we are so excited about next year’s calendar: it’s the first time Prince George and Princess Charlotte have their own pages! I love the queen’s tiara it is so beautiful. Stunning! I agree with a previous comment – the DOC has really come into her own as a senior member of the Royal family; this young woman from Berkshire has evolved into a future Queen/Consort. 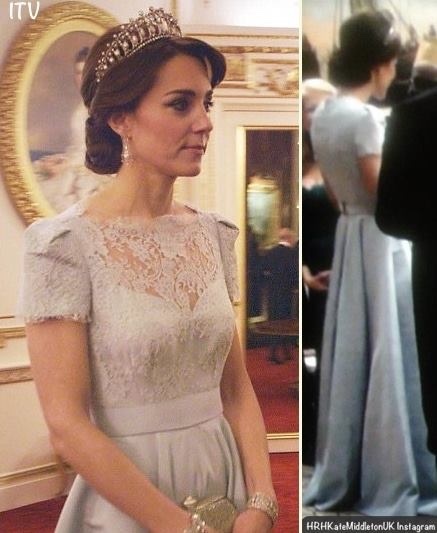 I love seeing Catherine in Jenny Packham – very elegant and regal as written in post above. 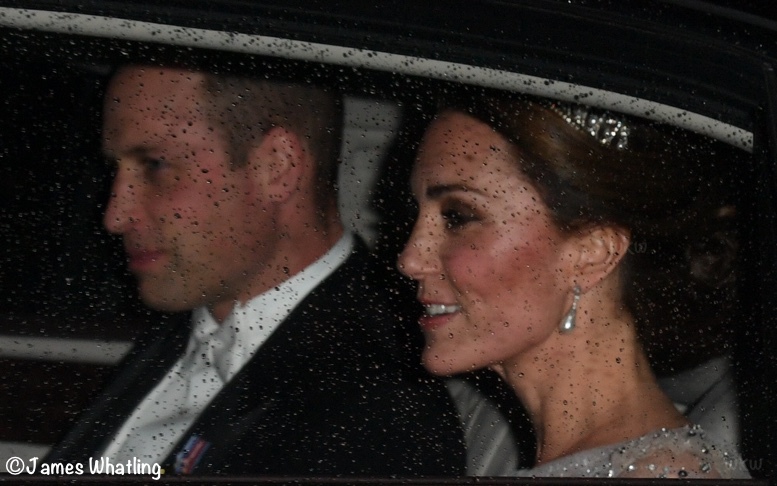 Tiara and other jewels – amazing; hair – love it – dress – gorgeous – I can’t recall seeing Catherine in this kind of draping before – I love the sequins and the overlay. All in all an absolute winner. Lovely gown, great look for Kate. Hard to go wrong with Jenny Packham. Her most princess-y look in recent memory (as far as my memory goes). I love it! And I’m envious – I want to wear it (and look as good as she does)! HM is tiara winner of the evening. Again with the light blue/icy white. Enough already! This gown would have been stunning in a lavender, or even gold. (Although I guess HM is wearing gold-ish lace, so that probably wouldn’t have been okay). When will the Duchess learn these icy tones wash her out?? She looks amazing in Jewel tones (The red dress featured above is a prime example! ), I just wish she would wear them more often! Don’t get me wrong, this is a beautiful dress, I just wish Kate would wear another color! Duchess Catherine looks beautiful and every inch a Royal tonight. I especially like the less hard, less “fixed” and less sprayed updo. It is regal and perfectly groomed but looks modern and touchable, unlike some of Kate’s updos. I am a bit puzzled, however, over why so many find this dress to be so special. The design is simple (and I like simplicity) with no element that makes it memorable (imho). Sequins don’t translate as regal or elegant most of the time as they are grossly overused on inexpensive evening wear. I also find this color unflattering. Clearer, more saturated colors flatter Kate’s coloring more, to my eye. And, I know I’m in the minority on this, but I don’t see the “Disney Princess” comparison as a complement to Catherine. I understand that the aspirational idea of the fairy tale princess is instilled in most of us as little girls. I loved all those stories, too, but I’m over that, I guess. I agree with others that I’d love to see the 3 British Royal Ladies together in a photo as I think we’d see a beautifully coordinated family portrait, much the same way they looked as they stood together on the balcony during the somber Remembrance ceremony. (And perhaps that need to coordinate since photos were being released is why Kate wore this color even though it isn’t as flattering as some others would be.) It inspires me to see these women who represent 3 generations each dress in a way that accommodates her figure, tastes, age and style. It’s a lovely study in how a woman is beautiful in every stage of her life. I still can’t quite believe we finally got pictures from inside the Diplomatic Reception after all these years. As other have said Catherine looks like a real life storybook princess. I really love the delicate top of the dress and how the embellishments are more subtle than a couple of her previous Packham dresses. Absolutely love it. Stunning and regal. It’s my favourite too and I’ve been hoping she’d re-wear it again. I’d like to see this gown in person but on my computer screen it’s reading very pale and the transparent draping around Kate’s neck and face does not compliment her or enhance her skin tone. There are two other gowns by Jenny Packham which I prefer and both are icy blue but a bit more saturated in color. One is the chiffon from October 2015 (draped lower back with a hint of skin) and also the full length dress worn to the Royal Variety, a sheer blue overlay with silver beads and sequins. “From Her Majesty’s Jewel Vault” Kate’s earrings are identified as the Collingwood Pearl and Diamond Earrings (from the collection of Diana, Princess of Wales). I really like this dress on her! I shall refer to this as her “Snow Queen” dress. I saw some comments comparing this to her Elsa Frozen dress which she wore to a performance or show. I think I was in the minority in not liking the Elsa dress-it went too overboard with bling and sparkly for my taste. This dress’s shiny embellishments are more sedated and the lines to this dress are much cleaner and simpler. I like how she, Camilla, and the Queen coordinated. I dunno if they communicated about it beforehand but it makes sense if they did since they are all wearing white/cream colored dresses. And while I think the Lovers’ Knot tiara looks fine on Kate, I prefer the Queen’s in this instance because it is smaller (or maybe just my impression since the Queen is so short). I’m just a minimalist, the smaller the better! Thank you for sharing these beautiful pictures and all the work you do to inform us. This is my favorite dress because you can’t take your eyes off of it. Her accessories are just as beautiful. She looks amazing. Again, Thank you for all you do and the pictures are so appreciated as we can see her from head to toe. Well, it’s no secret that I’m a lover of all things sparkly, romantic, and feminine… so I think this is an absolutely gorgeous look on Kate. She’s just stunning floating into the room like an ice princess at a winter ball. I really liked one commenter’s idea that Kate looks most like a princess in Pachkam and like a queen in McQueen. Hadn’t thought of that before, but I agree with it. And goodness, tiaras aren’t your every day accessory… they don’t get switched out like necklaces or earrings. I know she obviously has worn a couple of others before, but most of the Royal ladies tend to find a favorite and stick to it. I personally like this one because it’s not as small as the other couple that Kate has worn, but it’s not as large as one such as the queen or Camilla favors. It has just enough precense for Kate, in my opinion. It would seem wrong for Kate to wear a tiara that is larger or more showy that what her elders are wearing. Perhaps that is why she sticks with the more delicate designs – Camilla favors that large tiara and the queen often has something bold. I don’t expect to see her in any tiara larger than the lovers knot anytime soon… if ever. It’s taken her long enough to branch out with the larger jewels, as it seems she’s more comfortable in dainty ones generally speaking. I really can’t picture her wearing a tiara the size of Camilla’s … ever. But Camilla pulls it off quite well. I love this. It’s stunning, the kind of dress every girl would dream of wearing. I look forward to one day finding out what was being worn Dec 17, and the recent pink one-shoulder dress! They can’t stay UFOs forever. Everything flows , drapes, shimmers and looks stellar and fantastic on her! Hair, jewels and that smile! Oh the tiara too! Y’all are bonkers. I LOVE this look. Like LOVE LOVE this look. Like I’d take it out for a fancy dinner and ask it to marry me, love this look!! Are you my daughter Stephanie? Something she would say! And I agree. It is beautiful. do you think her slouchy boots yesterday were the same ones that she wore in the black sequence dress from 2007?? As soon as I saw those sheer cap sleeves through the car window I thought “Peckham!”. Kate looks absolutely radiant. The sheer panel/gathering above the waistband reminds me of her teal Peckham gown recently reworn. I love her look. The Lover’s Knot tiara is one of my favorites, but I would like to see her start wearing some others. The Queen Mary Fringe or the Queen Alexandra’s Kokoshnik are similar and simple and with her height and willowy figure would be stunning. The Oriental Circlet is one you don’t see often, but with the reds she so often chooses it would be pretty. Kate is always radiant, and the Lover’s Knot makes her glow! But this dress is a big “no” for me. It looks like a high school prom dress with some extra draping on the shoulders and bodice. There just doesn’t seem to be much design to it–very simple and very sparkly. But, so as not to be totally negative, I do like the color of the dress. The cool, icy white is striking with all those gorgeous diamonds! Beautiful dress. Just enough sparkle and the tiara does the rest. Glad we got to see the entire look with the official photos. Hope they decide to do this every year from now on. KATE IS WEARING PANTS IN CYPRUS! I know right!! I was shocked and thrilled because not just pants wide legged pants!!! I am so excited to see the post on that look! I even like her makeup in the pictures for Daily Mail. She is always so beautiful but I think can sometimes be heavy handed during the daytime. She has the diamond lotus tiara, also known as the papyrus tiara, but I think the Cambridge Lover’s Knot tiara is beautiful on her. It was Diana’s favorite tiara, and Catherine is wearing it with the same pearl drop earrings that Diana wore with it. I think there’s a bit of messaging in these choices for her and William, because the reference to Diana is unmistakable. What a nice choice for a winter gala. Sparkly and white like ice and snow. I love the draping across the bodice and sleeves; very Packham. Hard to ignore associations with Disney princesses, though certainly it’s not intentional–and as I pointed out in a reply elsewhere, it’s of course the Disney princesses that are emulating real-life princesses like the DoC, not the opposite. I wouldn’t say I *dislike* the Lover’s Knot tiara, but I don’t seem to like it as much as the DoC seems to, or Diana before her. Personally, I might have chosen a nothing-but-diamonds tiara to go with this gown–just to fully own the razzle-dazzle. I liked BethE’s observation about how Jenny Packham delivers a more princessy look and McQueen a more queenly one, and I think that’s true, and I think it’s interesting to look back on previous appearances and speculate about when she might have chosen one over the other, and for what kind of event. I’m thinking, for instance, of her absolutely regal presence in Sweden, in the blush McQueen with the jeweled shoulders, when she and Prince William were representing the Queen abroad. 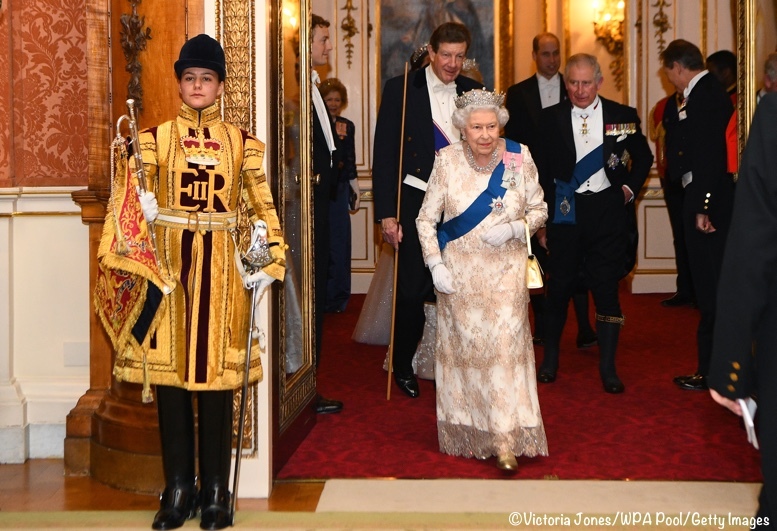 I’m so glad to have had full-length photos of the last couple of Buckingham palace events! I hope the trend continues. This dress is meh. Idk it’s so frilly. I don’t think it suits a woman in her mid thirties. Sigh. So ethereal and beautiful. She wears clothes so exquisitely. And her makeup looks fantastic. Can’t wait for the post today about her–gasp–wide legged trousers in Cyprus! I mean no disrespect, but I can’t think of anything less flattering than being compared to a Disney princess. Make-believe, animated, and cartoonish. I see a woman in a very pretty gown at a white tie party. I’m not sure what qualifies it to be called “princessy” but perhaps that’s because I was never one of those girls who wanted to grow up to be one, and who rejected the Disney/Cinderella fantasy at an early age. As someone else remarked, it’s a safe, conservative dress, another take on the Packham evening wear look. The ruched fabric on the sleeves and back of the dress is a nice touch. The sequins are fun, and I like the deep hemline. As for the tiara — in for a penny, in for a pound. I think they all look sort of dated and irrelevant in 2018. (Gasp!) While I love to look at all the jewelry, tiaras leave me cold, and the bigger they are, the more obtrusive they are. Now, don’t jump on me because I don’t like tiaras and don’t think they add anything to Kate’s look, or anyone else’s for that matter. Kate looks pretty and elegant and that’s sufficient. I do agree about the dress. Standard JP gown that is both safe and conservative. Reminds me of the blue JP from Paris and the other sparkly blue JP worn for the Royal Variety show when she was pregnant with Chatlotte, neither of which I liked as well. That said the embellished fabric is pretty as are several design elements but as it did with several other posters, it is conjuring up prom gown associations within my mind. I feel the gown lacks an inherent sophistication and might suit an ingenue better. Also, something about the fit is off? It seems to hang off her without a focal point of definition. A nipped in / defined waist or belt might solve that problem. Well good heavens, I mean–she is a princess; that’s part of her royal title. The problem, I suppose, lies in comparing her with the Disney Cinderella as if Cinderella is the standard and the DoC is emulating her, when in fact it’s really the opposite that’s true. There also *are* similarities in the dress that are hard to ignore for those who grew up on the Disney movies–though I am sure none of it is intentional on Packham’s part. Not jumping on you about tiaras, I promise–just pointing out that I believe they’re required for functions like this, so her only choice is about which one she’ll wear. She’s more fond of the Lover’s Knot than I am, but I do think she wears it well. Yes, she is the Princess William at the moment, and will be the Princess of Wales later on, I think. Right? Unfortunately, the Cinderella/Disney rendering may be the standard now, given the fact that the movie was released in 1950 and is ubiquitous. Movie, dolls, books, costumes, Disneyland and DisneyWorld. Everywhere. I’m not equating some Disney animators with Michelangelo and da Vinci — heaven forbid — just clarifying what I posted before. It’s not at all that Kate is emulating Disney. It’s that others use Disney as a measure for Kate, unfortunately. Not jumping on you, either, and thanks for the tiara info. Hoping she’ll switch to smaller ones, then, soon. You pose a great question: what constitutes “princessy”? To me, it’s a frothy, romantic, ethereal elevation above the mundane tedium of life. Perhaps including a bit of impracticality, without absurdity, and a sometime perhaps a hint of whimsy. Now, all those words might be why you, as did I, moved away from those stereotypical aspirations in youth. So, when I use “princessy”, it is more to capture the affect she achieved, without inherently including either censure for the choice or implying that it would be a style I chose for myself. European sensibilitiess, particularly of positional birthright. So to that extent, they do seem incongruent to 2018 cultures where meritocracy and a concept of basic human rights are foundational to social mores. Perhaps that is why they largely only come out at events like this, where a panoply of heads of state – some atop societies where “the divine right of kings” still dominates the class structure and culture – are comingled. To whit, tiaras serve their role, not as a fashion statement, but as a form of diplomatic currency. THANK you for your comments on “Disney princess.” I couldn’t agree more! The dress is near perfect from shoulder to waist to hem, and I see it as a statement dress, beautiful and even romantic, but for an adult woman with a serious role. I like tiaras, though, Diana fan though I am, I am getting a little tired of this one. But the tiara, too, could be a statement about legacy and about the Duchess’s current and future role. It is spectacular and beautiful. I prefer smaller lighter designs but it echoes the icy sparkle of the dress nicely as well. I was expecting to see only a head shot of them in the car leaving but this is a treat! Wonder why they changed and decided to release photos? Kate looked every bit a princess tonight amd radiant. On my screen the dress appears to be the palest of blues not white which leads to more Cinderella vibes. Not a bad thing to this disney fan haha. Im not always a fan of cap sleeves but the fit on her is flattering and the beading and shimmer is so lovely. I do wish she had mixed it up with the tiara though. Shes worn others before so i thought that meant she had 2 or 3 in her jewel box to choose from. Is it possible she keeps wearing this one because of the role shes stepping into? She looked very festive in her plaid this morning too. Great job bringing us double posts again Susan, try to get some rest! And like another commenter said I hope there is a group family photo released. All the ladies coordinating would be really pretty..
After the last diplomatic event where Kate wore the Lovers Knot, Camilla the Greville/Grenville, and the Queen the Girls of GB & I, I am even more convinced of my theory that despite a plethora of tiaras to choose from, they all have their sort of… signature tiara that they wear and perhaps break out the others for other events. When Kate wore the Lotus Tiara, because it was her first (if I recall correctly) I think it was both her trying to decide and than later changing her mind, and also being diplomatic as I believe they were hosting dignitaries from Asia (she also wore red with it, which I believe is a good luck color in some cultures). Although I do wish we would see more of the Queens collection, I suspect it will be Lovers Knot for Kate from here on out until she is Queen Consort. Thank you Susan for your AMAZING blog. For some reason, this dress reminds me of two of my favorite gowns of hers—the icy pink Packham that she wore to her first BAFTA’s and the lilac McQueen worn on her first tour of Canada and the US—-the lovely sparkly overlay of the Packham and the trim gorgeous waist of the lilac McQueen. Essentially, this dress reminds me of 2011(ish) Kate’s sartorial choices and I think that is why I love it so much. I agree with another poster that the blusher seems a bit heavy but that is just a quibble. All in all, I think the duchess looks just gorgeous all the way around. She seems to be very confident and is coming into her own as a future queen. I don’t think the makeup is too heavy at all! I love that she went with a stronger lip color, something that I wish we’d see her do more often. I like this tiara with the dress, but I wish I could see it with the Lotus tiara! I can’t imagine having so many dresses that look the same. She favors all lace or these frothy sparkly dress. Pretty but the heavy makeup really distracts from her overall look. I think an all diamond tiara would have better suited the gown. Seeing the Duchess of Cambridge in a tiara always makes my day. And, seeing the two of them so obviously happy makes me smile. All around good feelings today! I am so in the minority, but this looks like an off-the-rack prom dress to me. She’s 36, right? Time to start dressing like a woman and not a fairytale princess. Lovely dress. Sometimes I think her dresses that go full on Disney princess end up looking a bit twee or a bit prom-dress. But this one hits the mark, it’s every little girls’ dream princess dress, yet still age appropriate and sophisticated. Just an all round gorgeous look. As to her wearing the Lover’s Knot tiara so often, I think it must just fit her well, she’s become used to the weight and- with her long hair- probably doesn’t have the same comfort issues that Diana did. Lastly, you missed the first overlay in the dress description, instead you’ve got overly. But, in a detailed two post day, a completely understandable error. even though kate always looks beautiful, i’m disappointed in her clothing choices today. the gown looks like something a young girl going to her junior prom would wear. it is not a sophisticated look for her, which i think is what is called for for an occasion like this. i also did not think much of her long plaid skirt and black sweater. the short sweater mad her look like she had no waist. she needed a longer sweater or a black blouse with a belt. Yes I agree about the evening dress, too little girly got a woman entering her late thirties. She doesn’t have a waist because she’s so slender so I also agree that a belt would lend definition. This is lovely. The neckline and the sleeves are interesting and the dress is so sparkly and ethereal. It just reminds me that while I don’t like Packham daywear, she has always done very well by Kate in eveningwear. All my favorites have been Packham, including the red above. A huge improvement on the McQueens, especially the prom atrocity. I am over this tiara though. I am not a big fan of pearls so I’d like to see something else, although it might be a question of access. I love how radiant the Duchess looks in this gown with the pearls and diamonds. She just appears to be floating through the hall. Thank you for double duty today! This evening post, with photos, was quite the treat. It’s been interesting to note the changes in Kate’s expression over the years to the calm confidence she radiates now. Her gown is just gorgeous as are the other ladies’, but I wish we could have the treat of video footage to see it, and the jewels on everyone, in motion. And, of course, the gentlemen in their family livery (which I’ll bet William discontinues once he inherits!). Today was a frustrating day, and this just put it all to rights. Oh my, this is most certainly a fairy tale princess gown. I love the dress, the sparkles, the neckline, the cap sleeves. 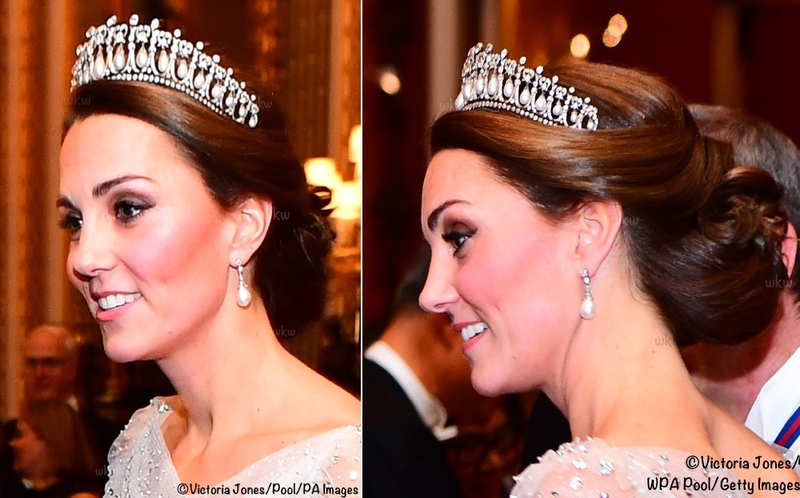 This is such a pretty look on Kate and the tiara, bracelet and earrings certainly enhance everything. My only disappointment is Kate’s very heavy makeup. The blusher especially looks so overdone. The Queen’s dress is beautiful with the tiers and gold lace. How lovely to see her gold shoes and bag instead of her usual severe black accessories. Camilla also looks elegant. All three ladies have certainly put on the bling. As they are all wearing varying shades of white, I would love to see a photo of the three of them together. That said, we are very fortunate that there are photos of this often non photo event. It just doesn’t get any more princess than this. Fabulous! This is one of those times that it occurs to me: Kate has decidedly come into her own as a member of “the firm”. This is a dress that is uniquely individual to her style, but also, when fitted into the sartorial mural of the royal family, it is not discordant or dominating. I’ll leave the details to others, and merely echo our dear Susan: spectacular. A couple other thoughts: the Queen’s dress is gorgeous, and Camilla’s tiara is fabulous in its art deco styling. And my final thought: it has become settled for me that Kate is most princess-y in Packham and most queenly in McQueen. Her continued partnership with these impecable design houses for high-profile engagements is, I think, a strategic choice in managing her public persona, both who she is today and who she will be in the future. See, I think McQueen does so poorly by her. The teal monstrosity that is better off forgotten and the ice blue one above to me are just two examples of bleh for me. She just looks prettier and more age appropriate in Packham. Agree with you about Camilla’s tiara. I love art deco pieces, like that and Eugenie and Meghan’s wedding tiaras. There is also a tiara of the Queen Mother’s that Camilla has worn that I love. I prefer seeing strong pieces like that to the frillier pieces. I have never preferred ice blue as a color choice for Kate, across all the designers she has chosen; McQueen, Packham, and Kane have all been guilty. So, setting those aside as a group, I suppose I was considering each designer’s work a bit more broadly beyond this event. The McQueen in Oslo would be the evening dress I would place vis-a-vis this Packham as the foremost example of that intangible difference I see in how each designer accentuates a different facet of her public persona, or dare I say, her own personality. There are times I find parity in their designs’ impressions (e.g., the Packham polo dress and the McQueen red/white/black separates during the Australia tour). And there are times when one might mistake the designer for the other (e.g., the recent blue Packham for the Canada arrival vs the lavendar McQueen in LA.) Both have certainly also had their polarizing choices (the mint maternity Packham and, as you note, the duck-egg blue McQueen). But, on the whole, I still find the overarching impression the same. Perhaps by “age-appropriate”, you imply “young”. And while I don’t disagree with that assessment, I find McQueen brings a maturity to her wardrobe that is not wrongly applied to her position, both as a mother of 3 children and a future queen. Regardless, pretty is as pretty does, and Kate elevates every ensemble with a good-hearted warmth and genuine smile. 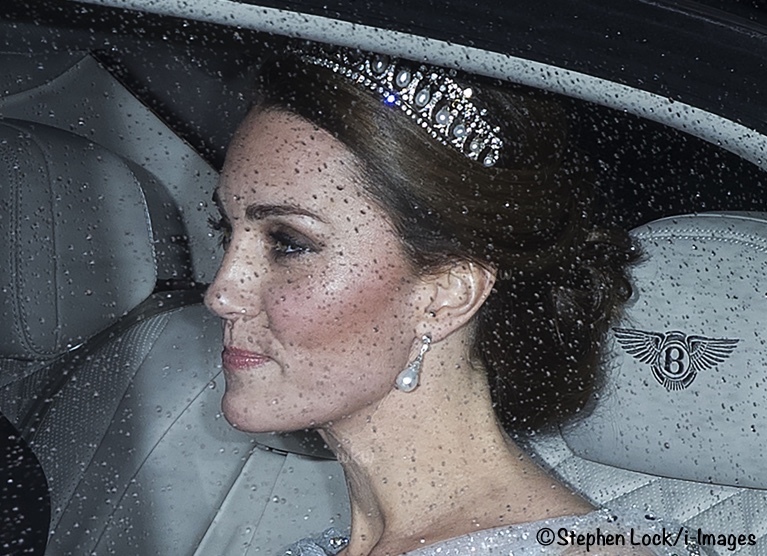 It’s just wonderful that Kate should feel so at home with such a superb tiara. I especially like the contrast between the smooth pearls and the sharp diamond facets, it gives a solidity and balance that can be missing from a more glittering all-diamond affair – thanks so much for the gallery of past Lover’s Knot outings. I’m delighted to see that gorgeous bracelet again too. This neat bodice with cap sleeves is becoming a signature style for Kate’s evening dresses. I like the way the ruched fabric is eased over her shoulders to form the sleeves by way of variation this time, and the classic Packham sparkling embellishment is saved from being uniform by the grading of the pattern at the top of the skirt. 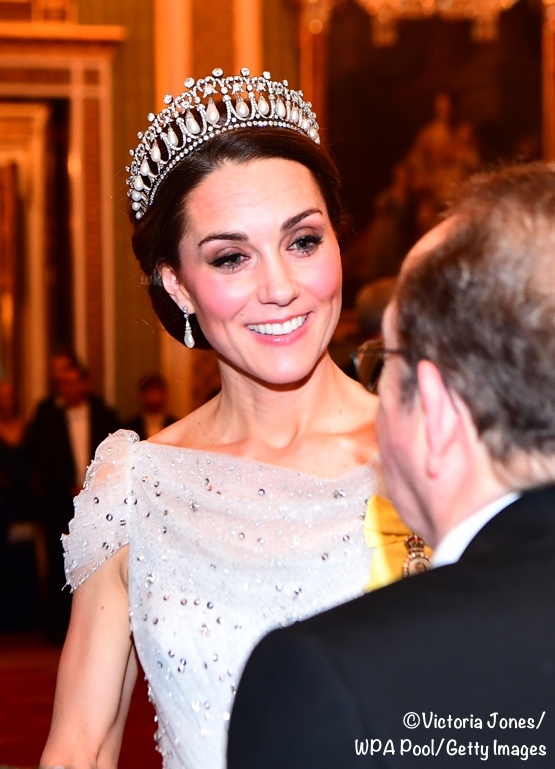 Her updo tonight is fabulous and Kate continues to look glowing and happy. It’s also very happy that we should be treated to some decent photos from inside the event this year. All-in-all, a sight for sore eyes in mid-winter! Kate looks gorgeous as always. But I have to say, the dress is good, but not stunning. It’s not a show stopper. It’s just a very safe, lovely dress. And it makes me remember her last ball gown which was absolutely a risk and many people disliked. (The teal blue “80s prom dress.”) So now we get the opposite: an absolutely safe and appropriate and lovely gown. I think I prefer the risky ones. But again, Kate looks gorgeous as always. And I love her updo with the tiara, and her makeup and jewelry. This dress was absolutely STUNNING. I gasped and my jaw dropped. She legit looked like a magnificent snow princess. I am so happy we saw this gown, I literally was speechless trying to figure out adjectives. PERFECTION. Reminds me of Disney Cinderella – in a good way. Like a perfect princesss. One of my gowns she has worn. Agree! Kate looks beautiful. So does the queen. I also never thought I’d say this, but Camilla looks very elegant too. I can’t tell you know much I appreciate and admire then unreal amount of work that you do for this page. HRH looked stunning tonight. I always get a lump in my throat when I first see that tiara, but I can’t think of a more beautiful young woman who should be wearing it. Her gown was stunning and I’m so proud of her for receiving the Order. I’m excited for the Cypress visit and I know you’ll have any post up for your followers to enjoy! She was glowing today. She’s always elegant and put together, but today she just had a special light from within. Maybe she’s especially happy in her family life right now. The dress is not my style, but I think she looks gorgeous and very appropriate for a young Duchess who will one day be Queen. I wouldn’t change a thing. Much as I love the Lover’s Knot, I was hoping she’d mix it up. She almost always goes for this tiara! I like the dress, but it didn’t wow me (much as the “Elsa dress” didn’t wow me). Not a fan of the sleeves or the sequins! 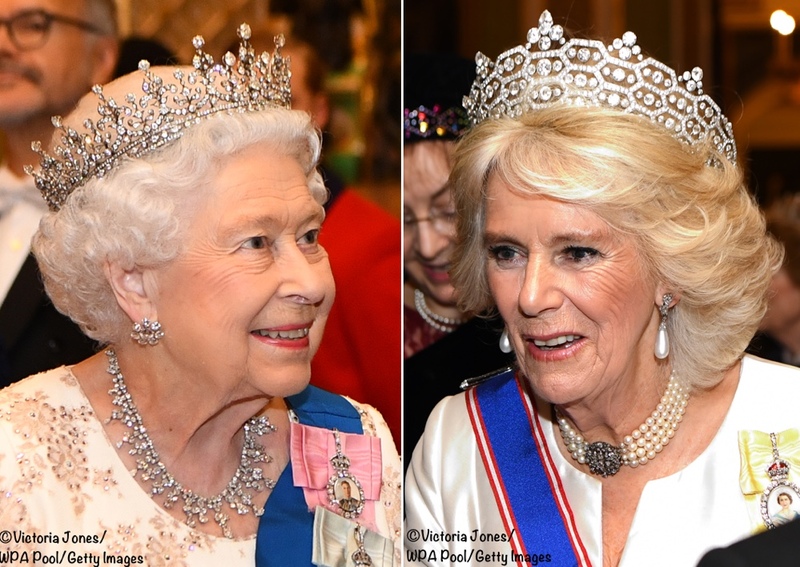 Believe it or not I am a HUGE fan of Camilla’s choice of tiara! She has the big feathered hair and the big tiara really works for her! Camilla looked wonderful tonight too. Her dress was perfect for a woman of her years and position. What a great surprise getting photos from inside the Palace! I’ve long been burned out on Kate’s ice-blue Jenny Packham gowns, but this one is flawless! The delicate shoulders and neckline are slightly reminiscent of Kate’s pink sequined Packham gown–a favourite of mine–and the way that the skirt subtly sparkles is absolutely exquisite. I love the way the larger crystals/sequins gradually fade out as they approach the middle of the skirt and the crisp, wide hem on the skirt as well. Thank you for two wonderful posts today, Susan! The design of Kate’s lovely classical dress was probably inspired by the superb costume worn by Maria Callas as “Norma” at the Paris Opera, 1965. Numerous similarities ! Like this Peckham dress, it was constructed of white fabric, drawn in fine pleats over the bust down to the centre-waist. The neckline was loosely draped in a loop. The cap-sleeves were similarly draped and looped. The beautiful classical design was finely-waisted and flowed into a semi-full skirt. Ahhhhhh!! 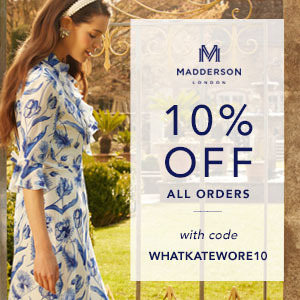 I clicked onto the blog fully expecting to just be inspecting the upper sleeves of some beautiful, mysterious frock. Instead I scrolled down to full length pictures! What a treat. This dress is stunning. I can see it making the Top 10 lists of many of the readers of this blog. I love it, though it’s not something I would personally pick out. She looks like a princess from a fairy tale, and the details are gorgeous. It feels more current and age-appropriate to me than the previously-repeated teal Jenny Packham. Hit it out of the park, I’d say. SSM, I was just thinking KM looks like a real life Disney princess, only better. She has the old razzle dazzle going on tonight.